Hugo Boss Hugo is a classic fragrance that still gives a cutting edge scent to the skin even though it was created in 1995. 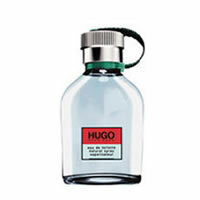 Hugo Boss Hugo is an aromatic, fougere, marine scent, with light creative notes that allow you to wear it just as you want. Hugo Boss Hugo is a refreshing, spicy, lavender fragrance that explores essences of fresh citrus, apples and pine, blended with notes of clove, rum and sandalwood, for a unique and modern scent.